Little bits of abalone shell in blue, green and purple are set onto textured copper and electroformed in a process that takes days from start to finish. They are oxidized and polished. 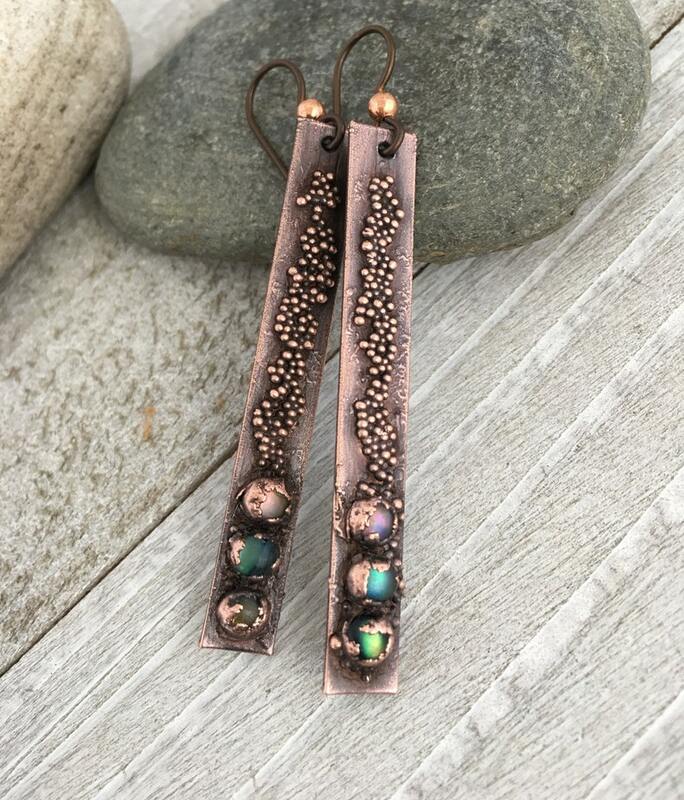 Hung on Niobium earwires with a tiny copper bead, these are unique and one off earrings. Beautiful and exactly as shown. So creative, so well done! I love them and they shipped out on time, love this artist! Very pretty drop earrings - raw amethyst. Very well made! Thank you! Very beautiful pendant - very well made, quality stone. I highly recommend buying from this jeweler, my first purchase and impressed with copper work and beauty of stone. Thank you! I accept Paypal or Direct Checkout through Etsy. I do not accept personal checks or money orders. Please notify me within with 1 week if you are unhappy with your purchase. Refund of purchase price minus shipping cost are available if item is returned within 30 days of purchase. Return shipping at cost of buyer. Custom work and special orders are not returnable. I ship by USPS, usually First Class Mail, sometimes Priority Mail within the US . Shipping dates are indicated for each item and indicate the time it takes to process your order and send it to the shipper. The time your package is in transit is in addition to these time frames. International shipping can take up to several weeks, depending on the Customs or entry requirements for your country. Any customs duties or VAT taxes that are levied by your country are your responsibility to pay. I have no control over them, and I cannot alter the value or any other information listed on the shipping label.